No food post today since it's Merdeka day. Hope all of you are enjoying the break and caught parts of the parade on television. The gun salute was definitely loud enough for me to hear from home. If you're craving for food, check out Babe in the City - KL's Merdeka Open House round up which features lots of yummy food. Last weekend, Splashie Boy's company held a Fruits Festival in aid of charity. It was great fun as there were loads of fruits to choose from. It was quite obvious though which particular fruit was the most popular - the King of fruits aka the Durian. Everyone made a beeline for it and it finished quickly. 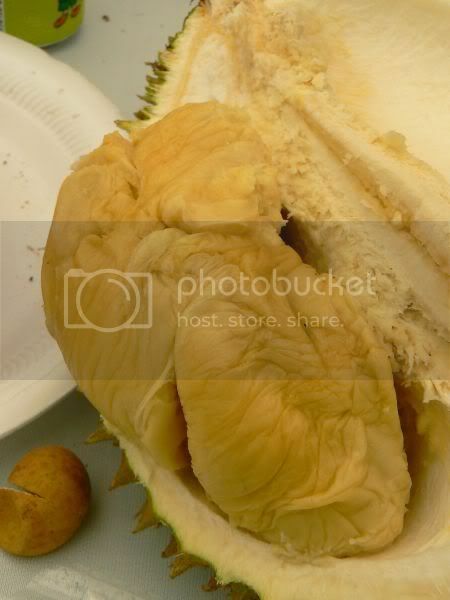 Even a second reload of durians saw everyone scrambling to get their share. What amazed me was the people who organised the fair had a special machine to open durians. 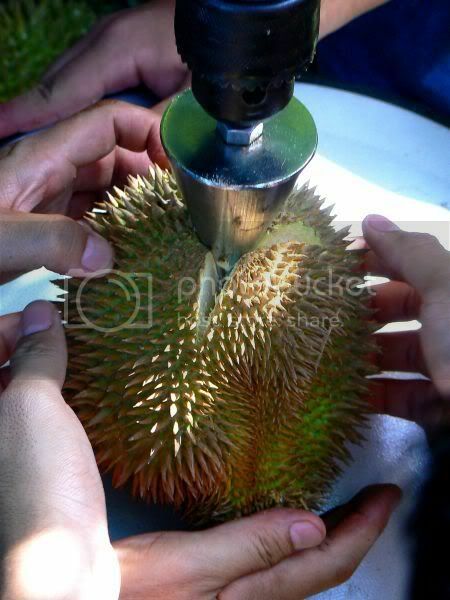 Essentially a drilling machine, they had adapted it with a metal spike at the end of the drill which could be used to open the durian gently. It became the focal point of the festival as everyone crowded around the machine to get their durians opened since there were no parangs. Although the opening for the durian has been made, some brute force is needed to pry the thorny skin to reveal the goodies within. Well worth the wait - creamy and rich durian within. The kids were also having fun as there was free flowing ice cream. Just help yourself at the cooler on what you wanted. There was also a dance performance by the children and lots of games and line dancing. Of course everyone did the usual dances - the Macarena, the Chicken Song and the ever famous YMCA with all the gestures. Tables were filled with fruits of all varieties which you could help yourself. People were also around to cut your chosen fruit. 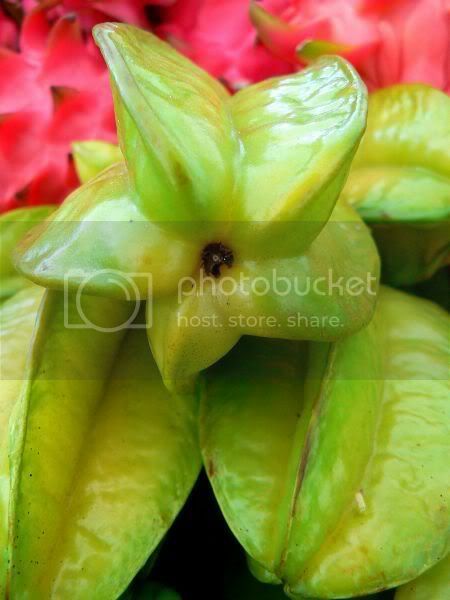 These star fruits (carambola) are great for health. They also make pretty star shapes when cut. 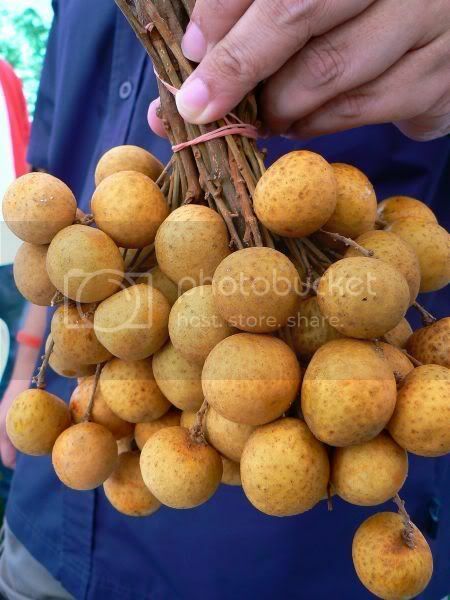 My absolute favourite - Mata Kuching or Cat's Eyes, the local longan variety. Here's Splashie Boy holding a nice bunch which we ate that afternoon. 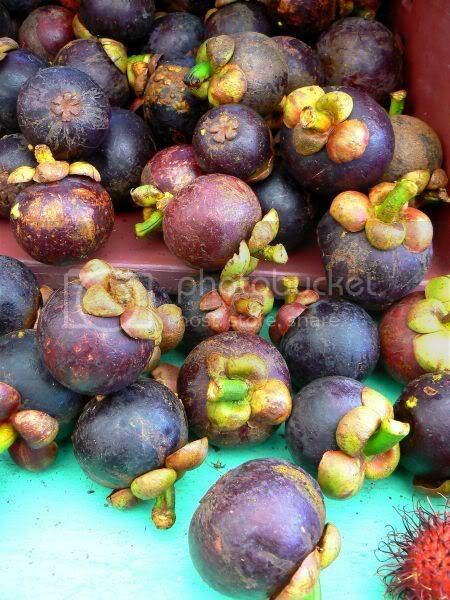 There were loads of mangosteens around to help cool down your body after taking the heaty effects of durian. 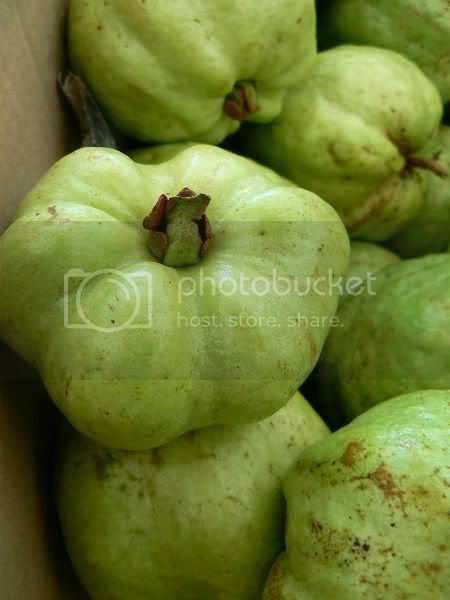 Apple green guavas, my mum's favourite fruit. They're not too sweet and some varieties are soft and seedless. I like taking them plain or sprinkled with that sourish powder made from Seen Mui (preserved sour plum). 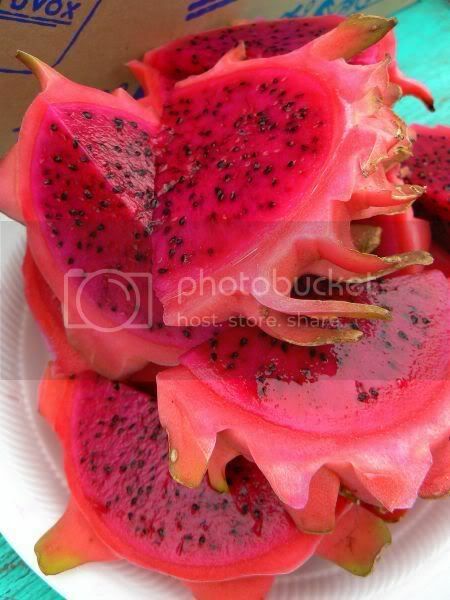 There were loads of these Pink Dragonfruit all sliced up for us to enjoy. The pink version is so much sweeter than the white ones. Nowadays it's pretty easy to get these fruits in local farms who plant a lot of these. 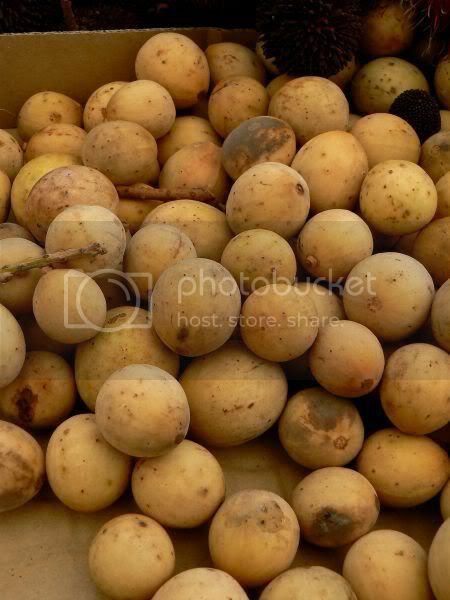 You can even make jam from this fruit, just pair it with pineapple to give it flavour. 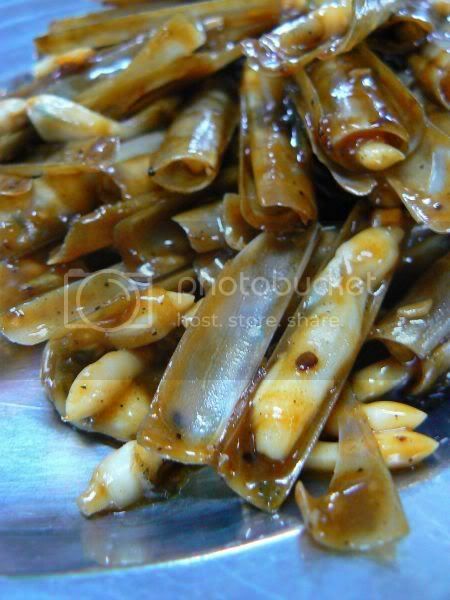 Duku Langsat were also available. I like this fruit but find it quite messy to eat as the sap of the skin creates sticky fingers. 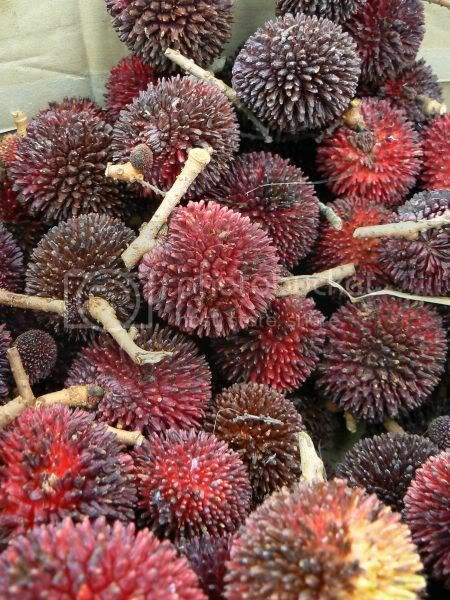 There was also lots of Pulasan, a fruit similar to rambutan except the flesh is thicker. 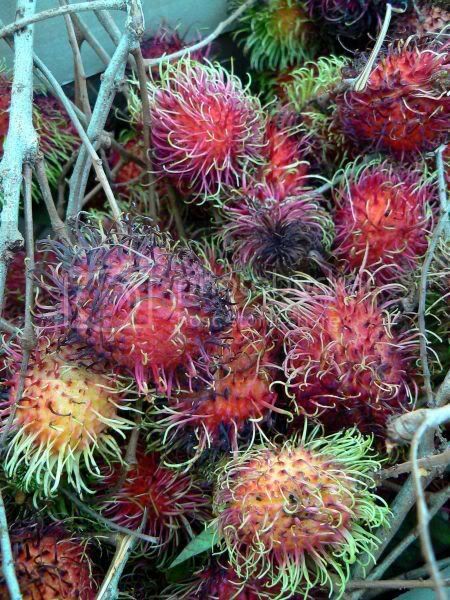 Lots of rambutan in a box. They taste really good cold. Usually when we get a bunch a home, we'll take the skin out and the seed inside and leave it covered in the fridge. Makes it easier to eat. Hope you enjoy the variety of fruits and Happy Merdeka and Happy Holidays! Enjoy yourself tomorrow with the celebrations. Something different today since it's the eve of the Merdeka celebrations. Babe in the City - KL is hosting a food event known as the Merdeka Open House 2007 with the Muhibbah theme. For this special Net event (there's no actual open house where we sit and enjoy the goodies! 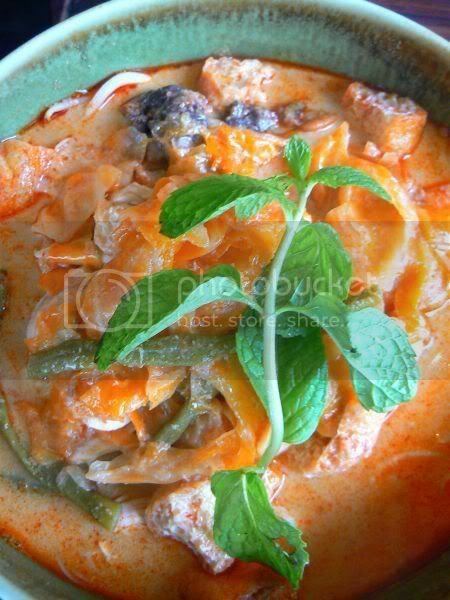 ), we are to post on a dish from another culture. Kinda hard to choose since I reckon all our cultures in Malaysia tend to meld and mingle with each other. Where else in the world will we find the unofficial Malaysian dish - the nasi lemak being cooked and adopted with variations by the Chinese and the Indians even though it's Malay by origin. Don't worry, I'm not going to cook Nasi Lemak as I reckon the ladies with their makeshift stalls on the side of the road do a much better job than me. Instead I'll feature a little known race known as the Indian Chittys from Malacca. A small community within the historical town, there are only a few families left in their settlement. Originating from India, their culture blends Malay and Indian traditions together. Most of them speak Malay and the women wear baju kebaya and sarung which is similar to the Baba Nyonyas. They also maintain their Hindu faith by celebrating Ponggal in a big way. If you ever visit Malacca, do check the settlement in Kampung Tujuh, Gajah Behrang as you'll learn something new. To read more about them, click on this Wikipedia link. 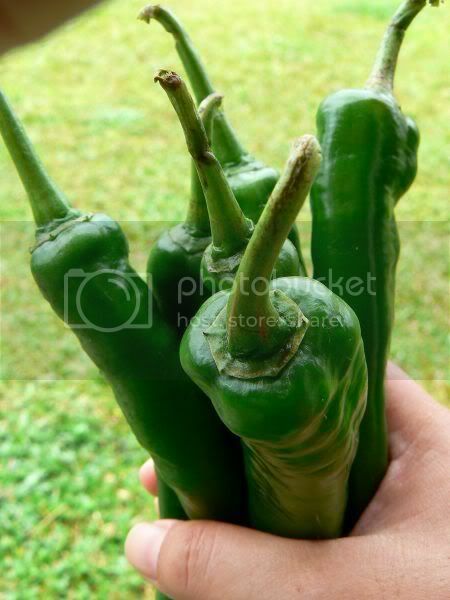 For the Open House, I've decided to cook the simple Pachadi Cili Muda or the Green Chili Pickles. Just make sure you get lots of fresh green chilies for this dish which you can keep and eat whenever you like with white rice. 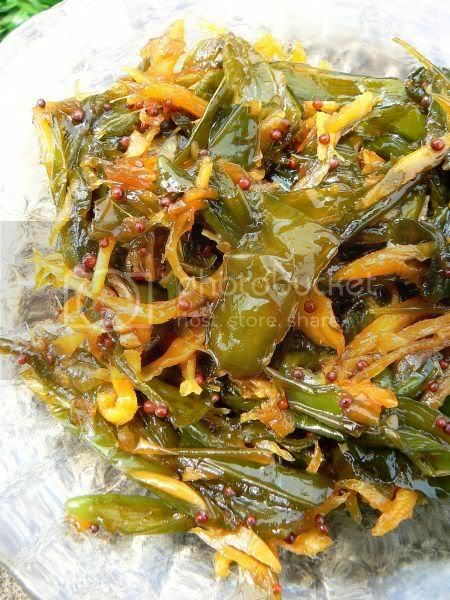 The pickle is not spicy despite the large amount of chilies used as the chilies cook down in a spice mixture flavoured with gula melaka and tamarind. Slice the ginger thinly and add salt. Set aside for 5 minutes. Put the ginger in a muslin bag and squeeze the juice. It's imperative you squeeze hard to ensure the ginger is dry or else your pickles will be soggy. If you wish you can also blend the garlic, shallots and ginger together before cooking it. Heat the cooking oil and fry the garlic, shallots, ginger, chilies, mustard seeds, curry leaves and gula melaka till fragrant. Add warm water to the tamarind and leave to soak for 5 to 10 minutes. Squeeze to extract the juice and strain. Add to the spice mixture and cook until it thickens slightly. Cool the pickles and pack in jars for use in the later stage. It goes very well with white rice. Nope, you're not experiencing double vision today! 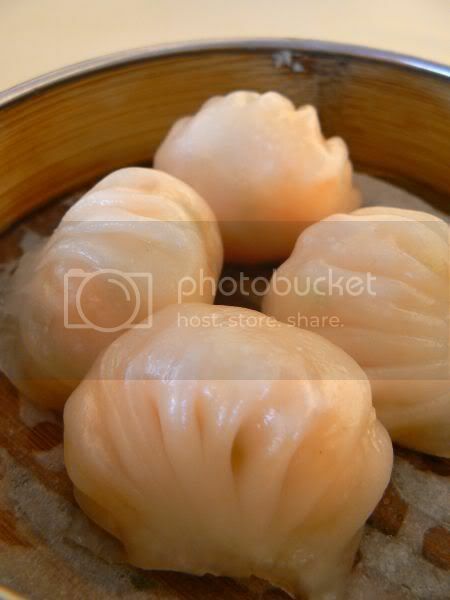 It's another dim sum post for the second week running. Last week when my friend saw the King Crab dim sum write up, she called me to give this place a try - Ah Yat Abalone Forum. Since I've not ventured here before, I was game for a bit of dim sum during lunchtime. No sinful fried items this time round though as she was suffering a bit of sore throat. Parking here is quite a breeze as there's ample space available at their underground area even though they share the premises with a Japanese restaurant and Unique Seafood. The restaurant area is huge, with no columns making it perfect for wedding dinners. Surprisingly it was packed even though it was a weekday. They're currently having a promotion - 50% discount during the weekdays and 30% discount during the weekends for their dim sum items. Here the dim sum items are all dainty versus big chunky ones. 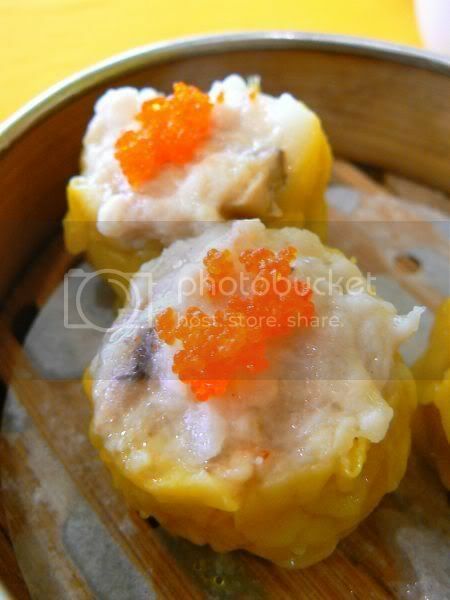 The Har Kau and Siu Mai was served in four tiny portions versus three bigger portions which makes it easier to eat it in one bite. What I liked about their dim sum was the prawns and meat filling was marinated with a mix of sweet rice wine giving it lots of flavour. 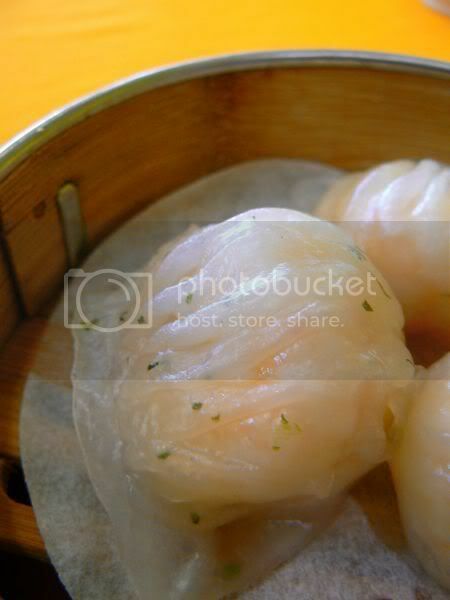 The skin of the dim sum was also nice and thin. They serve Hong Kong style dim sum here hence the dim sum dishes tend to be sweeter than what I have normally tried before. 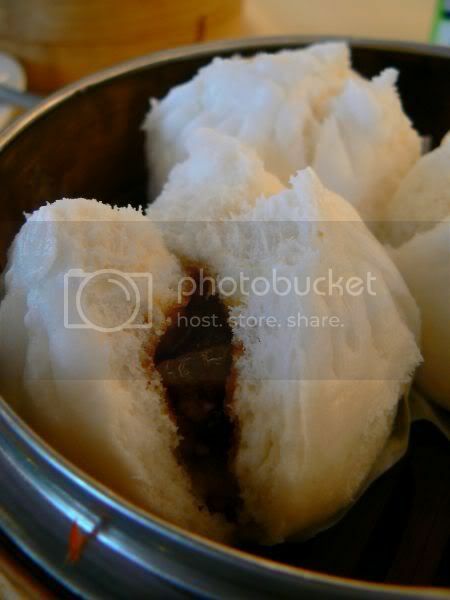 Their char siu bao was filled with chunks of fat though which will make anyone on a diet cringe. We both felt the steamed bao was a bit too sweet for our taste even though it was fluffy. 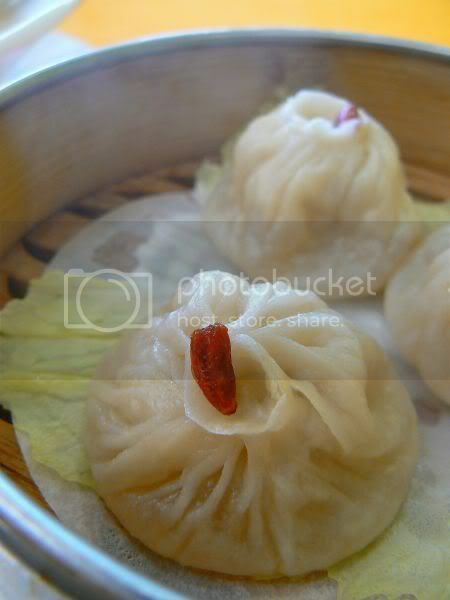 We also ordered the Char Leong - the typical Hong Kong dim sum item. I thought this wasn't too good as the yau char kuai within it was fried too crispy till it was a bit hard. Totally unlike the ones I have eaten at Hong Kong before. We had the braised Ee Foo Noodles instead of ordering more dim sum items. The noodles were quite nice with the noodles that remind me a bit of the type you get in your Hokkien Noodles minus the bounce. Also spied the next table having the Ah Yat Special Noodles which smelt so great. 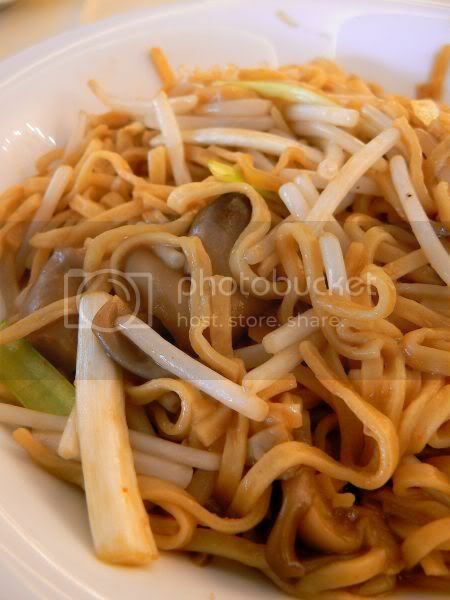 They fry it in front of you in a heated claypot and the aromas of the noodles were making me hungry. 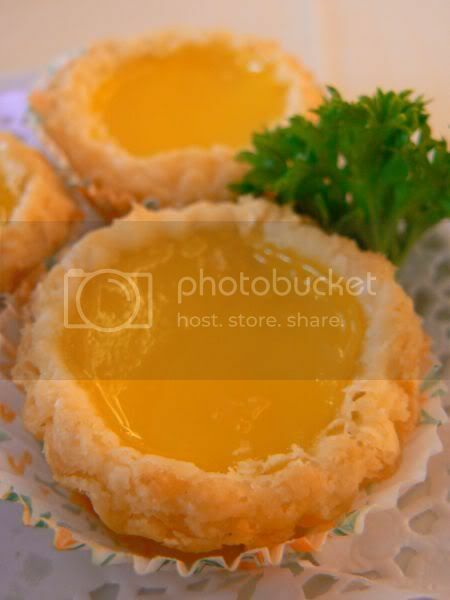 The best part of the dim sum lunch were these yummy egg tarts. Mini ones with flaky pastry and a wobbly egg centre, they tasted so good piping hot. I tested one when it was cold and it tasted just as good. When ever visitors from afar visit us in Kuala Lumpur, this particular place ends up being the first of the many food stops we take them on. These chicken wings have become iconic as THE food item you must eat whenever you visit at Jalan Alor. It's so famous that Zak Pelaccio who used to work at Seri Melayu restaurant in Jalan Conlay had recreated this in his famous restaurant, Fatty Crab in New York. 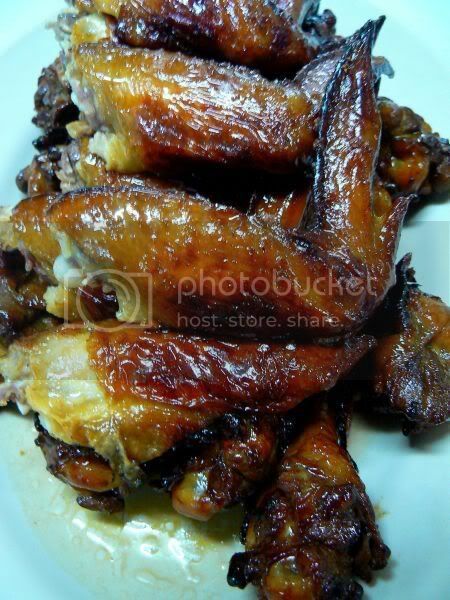 Known simply as Jalan Alor Chicken Wings on his menu, it's said to be dark and sticky. There's even a recipe to re-create his version on the Food and Wine website. I absolutely love these juicy chicken wings as they have a smoky flavour to them. Combined with a slightly sweetish marinade, it's definitely finger licking good. Although Wong Ah Wah is famous for chicken wings, they also serve cooked food or "tai chow" dishes. Since it's kinda rude to just order the chicken wings, we usually order a few dishes. 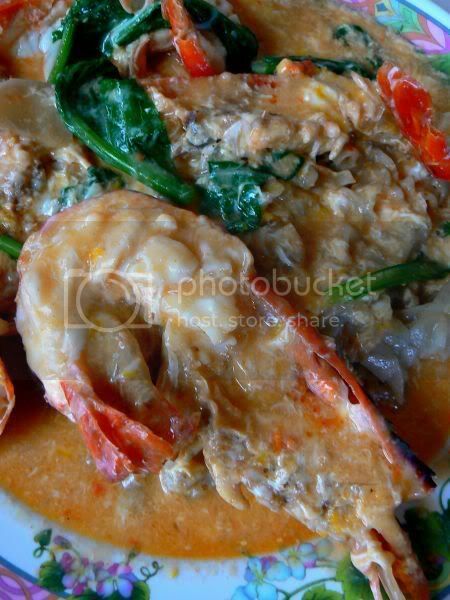 Seafood is always a good pick here so try their lala dishes. 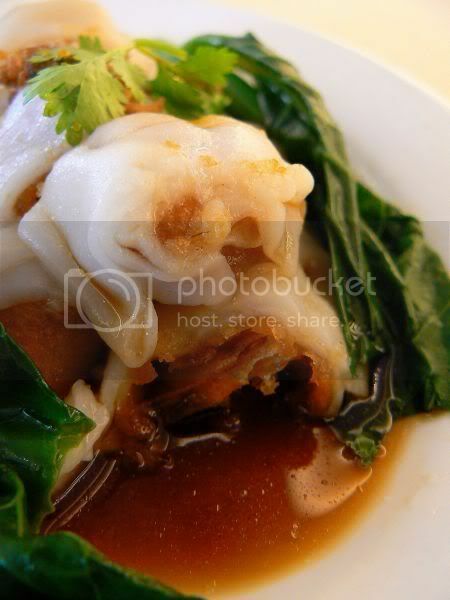 They do a good fried Kam Heong lala with a slight sweetish and spicy sauce filled with curry leaves for extra flavour. 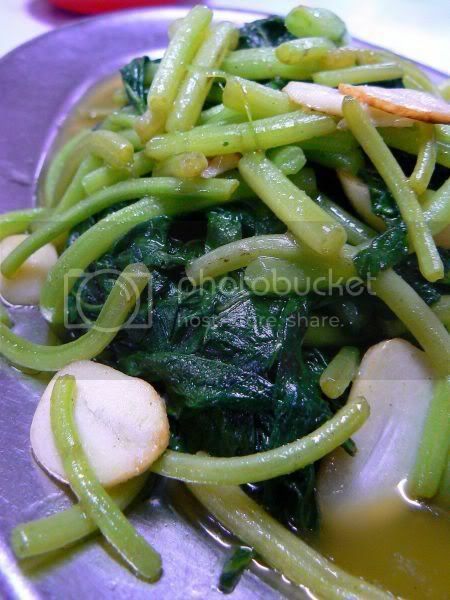 Another interesting dish is the Bamboo Lala. 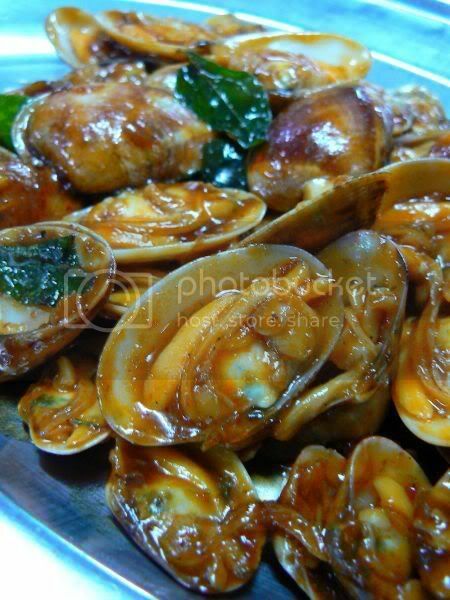 Shaped like a piece of bamboo, this shellfish is fried with a thick soy sauce and oyster sauce combination. I thought the sauce for this was quite bland and probably needed more spices to jazz it up a bit. Last but not least, one must eat our vegetables to be healthy. We ordered a plate of sweet potato leaves fried with garlic. This was not bad as one did not feel too guilty eating this versus a whole plate of chicken wings. With our tummies half filled, we strolled down Jalan Alor to search for more food. Let's chase those blues on this dull Monday morning with some scrumptious food. Ever since I discovered this restaurant in Batu Caves, I keep re-visiting it as I absolutely love their Sang Har Meen (Water Prawns Noodles). My family is a great fan of that type of noodles hence I was so excited when I discovered this place. When I brought my mother here, she was like, "Wow!" 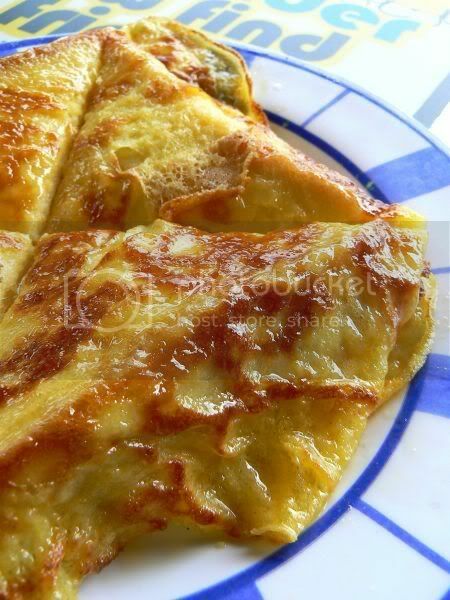 this tastes so sinfully good with the eggy gravy and the huge prawns filled with roe. Prices were also more reasonable versus the hiked up ones in town. Best of all was they don't use mee but kuey teow (flat rice noodles) here. It's an excellent combination as it absorbs the sauce better. Another plus point is sometimes when they fry the mee in other places, they tend to re-use the oil to economise and the mee has a slightly unpleasant smell. The minimum order for the noodles is two prawns which they slice into half for the roe to mix with the gravy. The prices are dependent on the weight of the prawns but as a rough guide, our noodles with one jumbo prawn and a slightly smaller one was RM36 that day. During one of my many visits here, we spied another table eating the Kam Heong Mantis Prawns (RM8) hence we ordered a portion. Very yummy stuff too as the prawns are dipped in batter and fried. 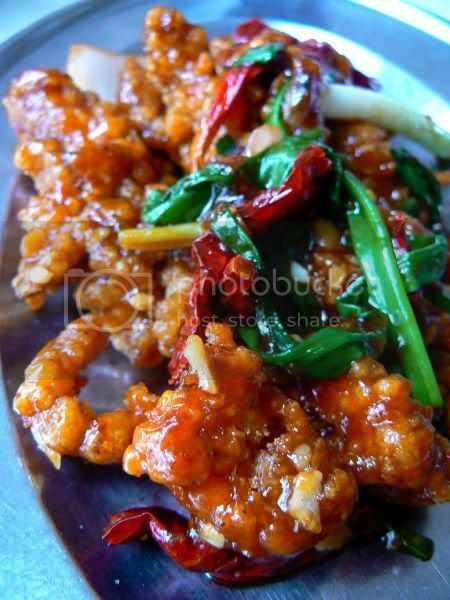 It's then coated in the sauce which has spring onions and dried red chilies. 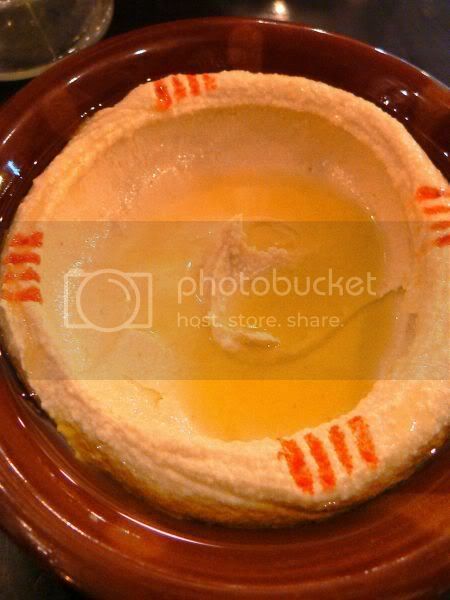 Also good is their porridge which is served in a claypot. You can choose what you wish to add into the silky smooth porridge whether it's pork ribs, chopped century eggs, frogs, fish and etc. What is also impressive about this place was I thought I needed to wait a while to get my food during the weekend rush hour (we were there for Saturday lunch). In fact, I brought the newspapers expecting for a long wait but food arrived so quickly I had no chance to even finish reading the local news section. There's also lots of other recommended items so check the other blogs below. When it comes to new things to try, always expect me to be the first in the line. 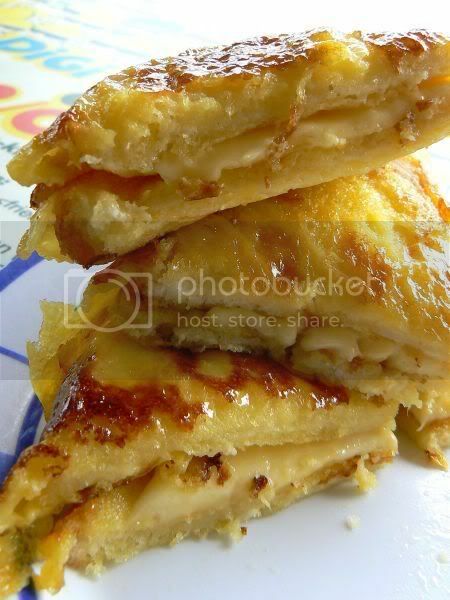 After reading Gluttons on a Diet where they were extolling the virtues of this amazing Roti Bakar Telur Cheese, I knew this was a MUST HAVE for my breakfast. When I ordered this at Spicy Kitchen, I was a bit hesistant since there was no signboards saying this particular dish existed. However when I told the man doing the roti canai at the stove I wanted the Roti Bakar, he straight away knew what I was talking about indicating it must be super popular here. It looked so beautiful when it arrived with a fried eggy topping. Essentially a French Toast, it consisted of white bread sandwiched with cheese and then fried with egg. What makes this unique was the taste - a combination of sweet and salty. The egg part was sweet like a French Toast but the cheese portion was salty. The combination of the two flavours worked so well together as it wasn't too cloying while the salty part was just nice with the thick layer of cheese. It's not cheap though as one portion costs RM4 but the cheese part is definitely thicker than those thin Cheddar pieces you find in the sliced cheese packets. Splashie Boy went for the conventional Roti Telur (RM1.50) which looked good too. He said it tasted nice even though I didn't get a chance to eat it. Breakfast here tends to be quite quiet compared to their night time business which always see them packed. 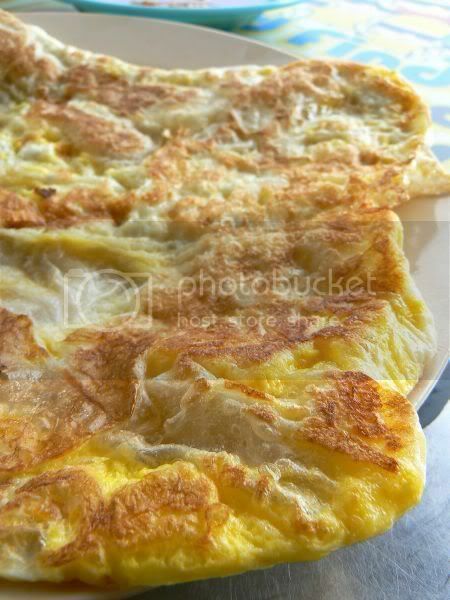 The Roti Bakar Telur Cheese is available at all hours so it's not necessary a breakfast item. Aside from this place in Desa Sri Hartamas, they also have one in Bandar Menjalara. This weekend, let me share with you these interesting pictures I took today when I was having breakfast. I was happily sitting a table waiting for my order while Splashie Boy went to get the weekend papers. Suddenly the tree in front of me started to shake violently. I checked the ground but there were no earth movements so it definitely was no earthquake. Next thing I saw was a white cat emerging from the tree. 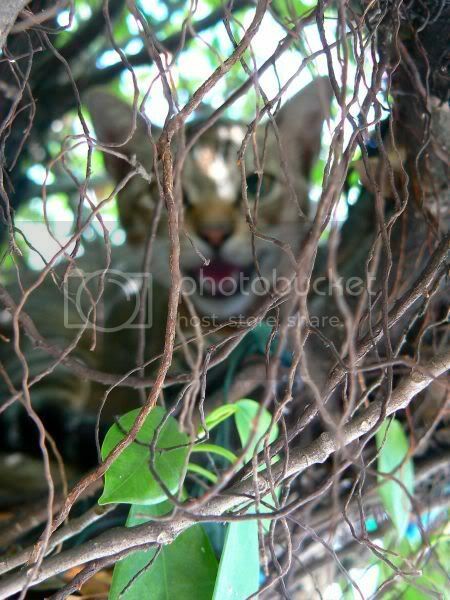 Due to the nature of the tree and it's branches, it had become a natural bower for the kitty to sleep in. 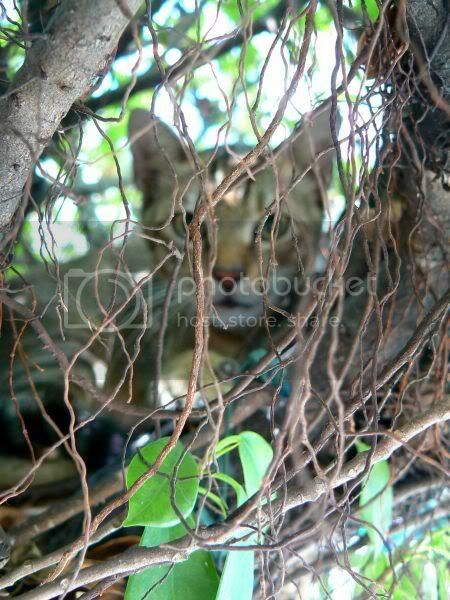 A closer look at the tree indicated that there was one more kitty sitting up there. At first, it was wary when I approached, then when I started clicking away, it started protesting. You can't see clear pictures of the kitty since he's at the background but there's no mistaking that angry look on it's face in the second picture. It eventually emerged from the tree after I went off. However, I had a good chuckle that these two cats were so resourceful to discover this great hiding place. For more kitty posts, visit the lovely kitties at Belly Timber who are hosting WCB. It often amazes me how diverse our food offerings has become in recent years in Kuala Lumpur. Nowadays we get so many choices from all parts of the world mainly due to the influx of tourists and migrant workers. If you're adventurous like I am, you'll have a whale of a time sampling different tastes on home ground without boarding a plane. Once when I ventured to the dark roads of Jalan Damai for a slice of Japanese heaven in Hajime, I was greeted by a row of brightly lit bungalows packed with Middle Eastern tourists. Vowing to return to further investigate this, we had an opportunity one Saturday night. Initially I was slightly apprehensive as there were no noisy crowds like the other time. Since all of them looked and sounded the same with the essential pre-fix "Al" name, we had a tough time choosing which one to try. Since hunger prevailed, we settled for a simple place which seemed to have more customers than the others. 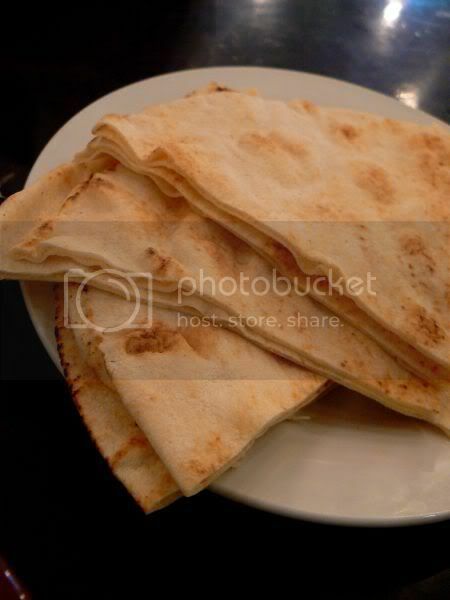 We actually wanted to try our all time favourite Middle Eastern dish - Mendy Lamb which we had eaten at Al-Diafah before. 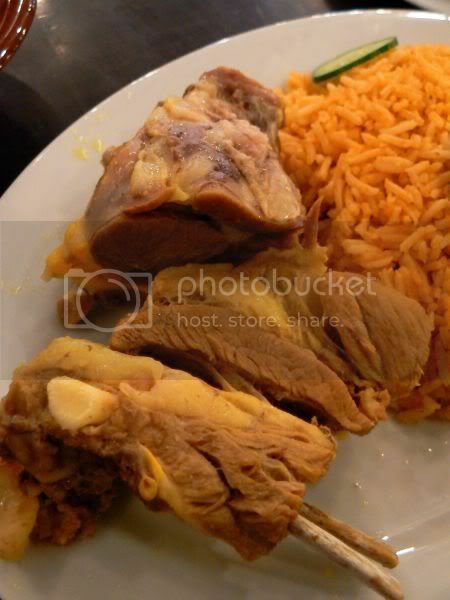 However, they had run out hence we were recommended their Lamb Kebsa. Food was quick to arrive while we sipped on our refreshing drinks. I loved their cooling Mint Tea especially since the place was not air-conditioned. For entertainment, we had a big projector screen playing an Arabic comedy. Even without subtitles, it was funny with an Adam Sandler lookalike. Lamb Kebsa came with a generous pile of rice, a sauce which kinda resembled tomato soup except it had potatoes inside it and a green chili pickle. Although the lamb was tender, it looked a bit daunting with a thick layer of fat. That was easily remedied as I removed that piece of fat from the meat which was tender. Eaten by itself the lamb was quite tasteless but it tasted really good with the sauce and the pickle. We had also ordered an appetizer - the Hummus which is made from chickpeas and a mixed grill. 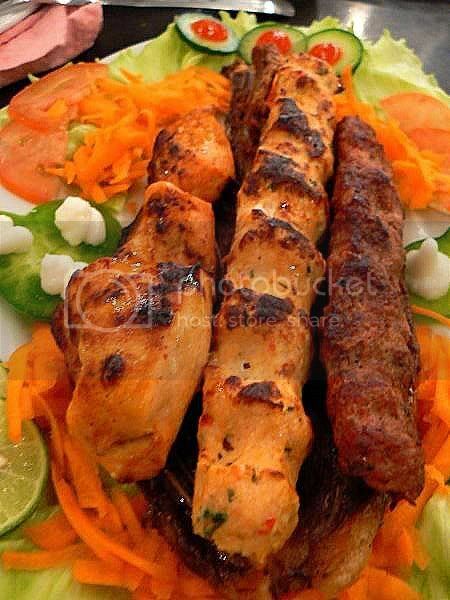 The mixed grill consisted of kebabs made from chunks of chicken meat, minced meat and a thin lamb shoulder chop. Everything tasted great especially the lamb chop which was crispy yet tender. Combined with the Hummus and the pita bread, it made a really substantial meal. Desserts were complimentary to all tables and they served a popular Middle Eastern favourite - Mehallabyah which is essentially a milk pudding flavoured with rose water. Very nice and refreshing. Prices are extremely reasonable here especially with the large portions served here. Although ambience is quite lacking since it's al-fresco dining, we liked the food served here and wouldn't mind returning again. I like to label it as a Middle Eastern mamak stall since it's open air like a Mamak and has relatively cheaper prices compared to a restaurant. One of the best things about being a food blogger has meant I've met quite people who're just as passionate about food. Hence when you're feeling down especially on a Friday, they're the ideal lunch partners to call to perk you up. After a long debate on where to eat around the Bangsar area where we had to contend with the Friday traffic and the parking woes around the mosque, we settled for House & Co at Bangsar Shopping Centre. Although I've known for some time about the House & Co's legendary lunch fare, that fact always slips my mind whenever I'm processing where to have lunch. Luckily Fatboybakes, that famous fella who bakes those yummy stuff reminded us about it hence we got a chance to sample the food. Packed with the "lunch time tai-tais", we scored a nice table with lots of light from Fatboybakes' efforts. We were all tempted to go for the Curry Laksa but since we wanted to try other items, I opted for their Nasi Lemak (RM15). It was a good choice since it came in an artfully arranged platter which made the other two food bloggers green with envy! Here they used pandan tinged basmati rice for their coconut rice which was wonderfully fragrant. 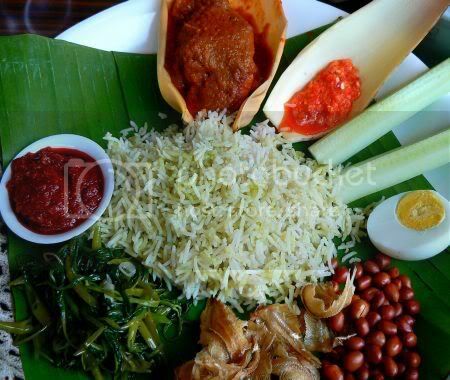 The sides like the chicken curry (you could change this for beef or sotong if you preferred) and chili sauce was served in the boatlike banana bud leaves. I especially liked their sambal - thick, slightly sweet with chopped onions. It went so well with the rice and the cucumber sticks. Another plus point was their crunchy ikan bilis. Totally unlike the puny ones we usually get, these were enormous in comparison. Sliced in the middle, the crunchy fish were all curled up in different directions. Lyrical Lemongrass and Fatboybakes both zoomed in on the Curry Laksa (RM15). Served in deep jade green bowls, the laksa was a hefty portion. I managed to get a taste of it and it was good stuff with lots of cockles, tofu puffs, chicken and noodles. Definitely something I want to return to House & Co for. Pretty Pui, Lyrical Lemongrass' friend had a Chicken Pita (RM12) which also looked good and laden with ingredients. Of course, we had to order desserts and who could pass over the decadent Chocolate Brandy Torte. 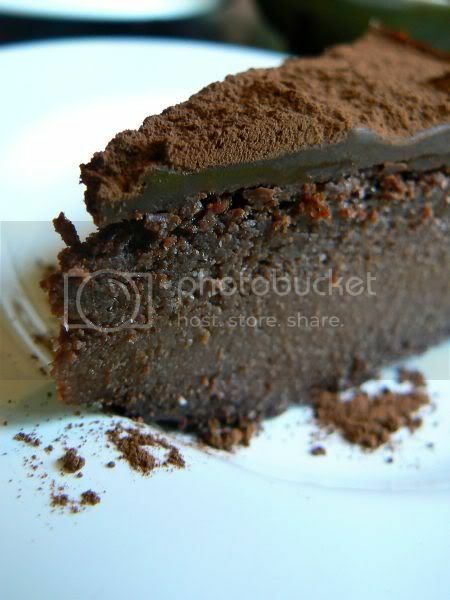 Sprinkled with cocoa powder on top, it was rich and sinful especially for lunch time when we shouldn't be consuming alchohol so early in the day. They also serve a variety of layer cakes here and we tried the Prune Version. Heated up it was really nice especially with the tender prunes. Surprisingly it didn't feel so decadent especially when one knew it was filled with cholestrol laden eggs. Although the food is great, the menu is pretty small (sandwiches, salads and a few Asian dishes) so don't expect lots of variety. Most people go for their signature Nasi Lemak and Curry Laksa or their generous sandwiches. Aside from amazing food, House & Co is also an ideal place to shop for furniture and household items. In fact, we bought most of our friend's Christmas presents here as we couldn't resist the pretty packaging (white paper and ribbons). So next time when you're scrambling on where to eat in Bangsar, remember this place tucked in a corner. I have a soft spot when it comes to knick-knacks especially those found at the 100 Yen shops scattered all over the Klang Valley. It's a great place to pick up Japanese items including cookware and snacks. Although I do love these shops, I try not to spend too much time there since my weakness for those tiny items will mean I'll end up buying them. We recently discovered that the 100 Yen shop in SS2 had converted their shop frontage to include a small stall selling Charmy Snow Ice. If I am not mistaken, this is something not new to KL'lites as I remember a similar or the same stall in 1 Utama. Although it's known as Snow Ice, it's essentially an Ais Kacang with shaved ice. Unlike our local variant which is just syrup and milk drenched shaved ice served with jellies, cendol, red beans and sweet corn, this one claims to have natural salt added in it. 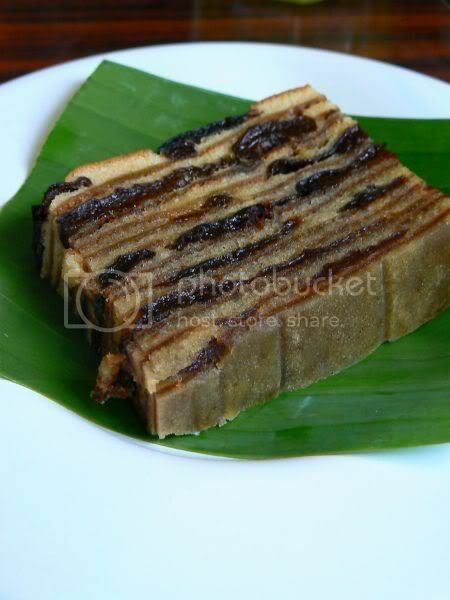 Boasting all kinds of natural substances, this particular dessert is said to be healthy. I'm not too sure about the health benefits but it does taste pretty good. We tried two varieties - the Mango Snow Ice which was very nice. Blocks of flavoured ice is shaved using a special machine which finely cuts it in wafer thin shavings. 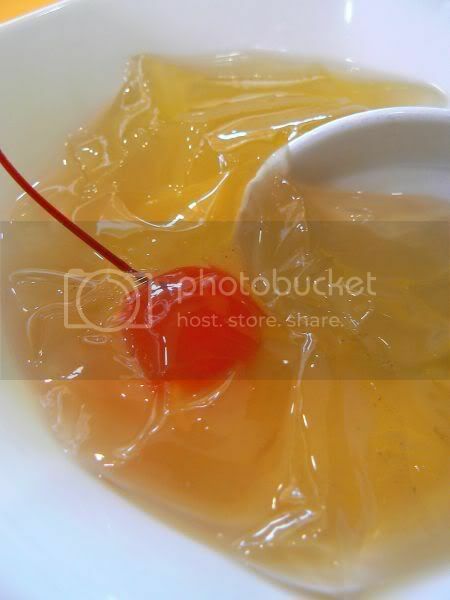 It's then topped with mango syrup and cubes of fresh mangoes. The other variety we tried was the Peanut Snow Ice which came with peanut flavoured shaved ice topped with chopped peanuts and chocolate sauce. 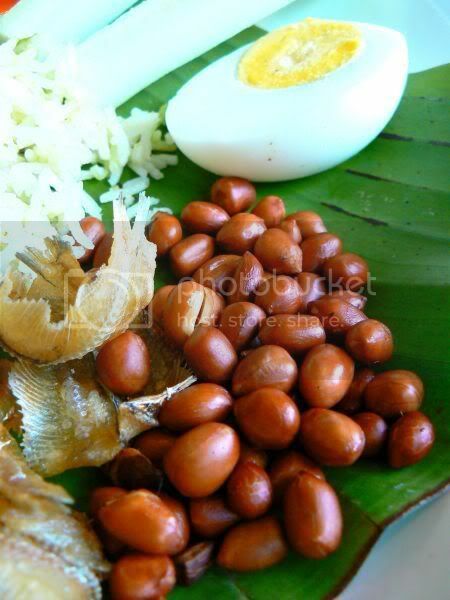 Very aromatic especially with the fragrant peanuts. There are lots of other varieties like Green Tea Snow Ice (which is served with red beans), Kiwi Snow Ice, Strawberry Snow Ice, Chocolate Snow Ice and etc. Like most items in the 100 Yen shop, one serving of Snow Ice costs RM4.90 each. The portion may look big but it's actually quite small as the shavings are so thin. Try this as a great way to cool down during the hot afternoon. It's available at all the other 100 Yen shops in Cheras, Puchong and Bandar Sg Long. Usually whenever we dine at King Crab, it has always been about their main dishes hence I decided to give their dim sum a try. My friend who is a regular there did the ordering and these are her favourites. You're given the menu so tick on which items you wish to order on the sheet. They'll send it back to the kitchen to prepare the items. We had some trouble looking for the Siu Mai as it's known as Steamed Dumpling Stuffed with Shrimp and Fish Roe (RM6.50) here. Although prices here are definitely more than the usual coffeeshop dim sum places, the fillings here are bigger. 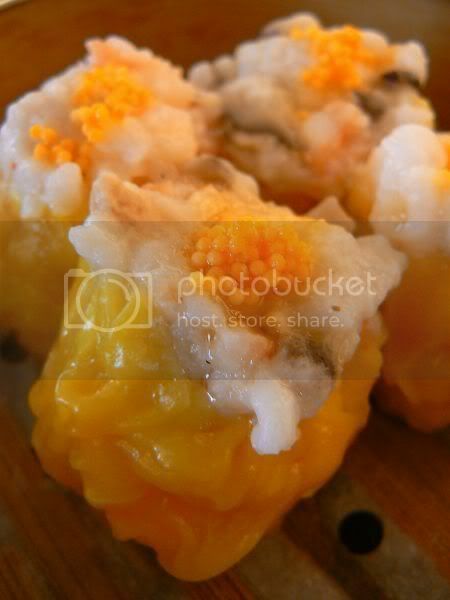 The Siu Mai was not bad with it's chunky filling of chopped prawns and pork. 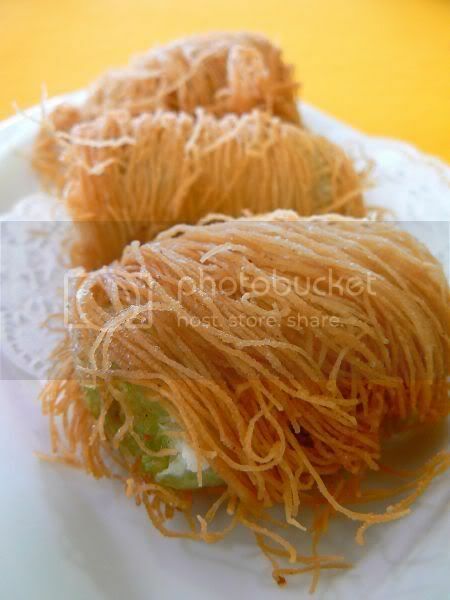 I really loved these Deep Fried Avocado Puff Rolls (RM8). They're my friend's favourites too and I can understand why as it's simply delish. 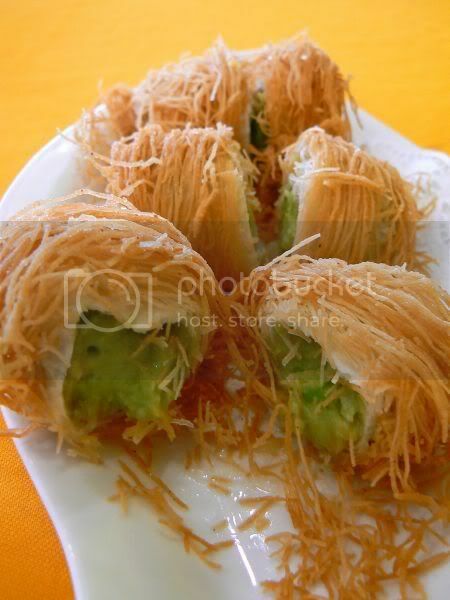 Wrapped with kataifi pastry, it's filled to the brim with the jade green avocado cream. 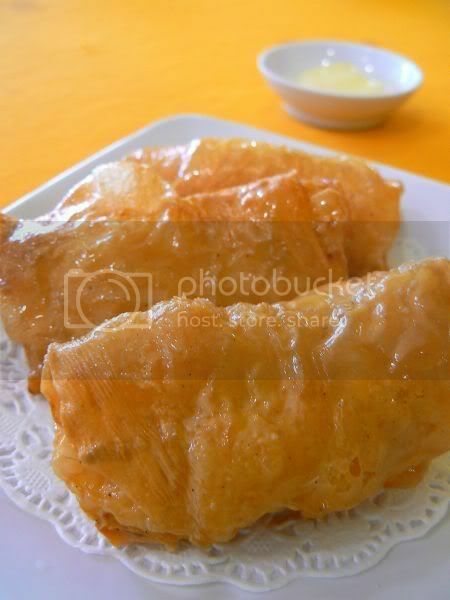 Another deep fried item - the Deep Fried Bean Curd Skin with Shrimp and Yellow Chives (RM6.50). It's filled with crunchy prawns and delicious when dipped in the mayonnaise. 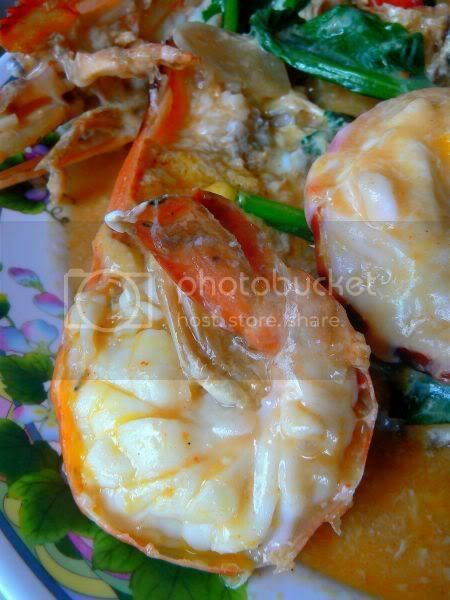 For the regulars of King Crab, you would have tasted their amazing green coloured Thai Chili Sauce. It's available for the dim sum items and believe me it tastes good with these deep fried items too. The sauce is now available for sale by the bottle so if you're a fan, make sure you carry a bottle everywhere you go. At one point of time, we had loads of items on our table hence we ate this a bit late - the century egg and pork porridge (RM4). I initially thought it's gone all thick like gunk since it was cold but when I ate a spoonful I was surprised. 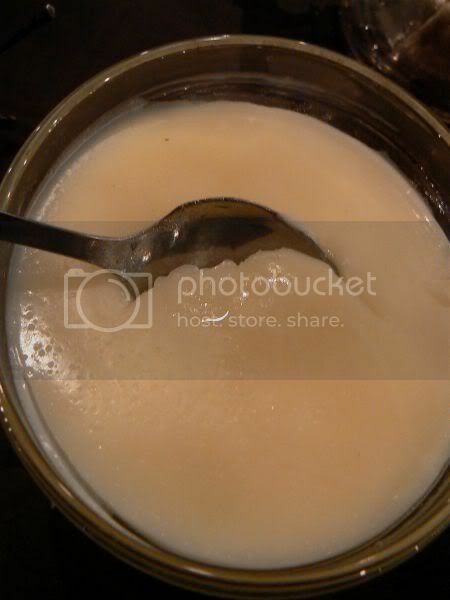 The texture of the porridge was smooth despite it's "thick" appearance. 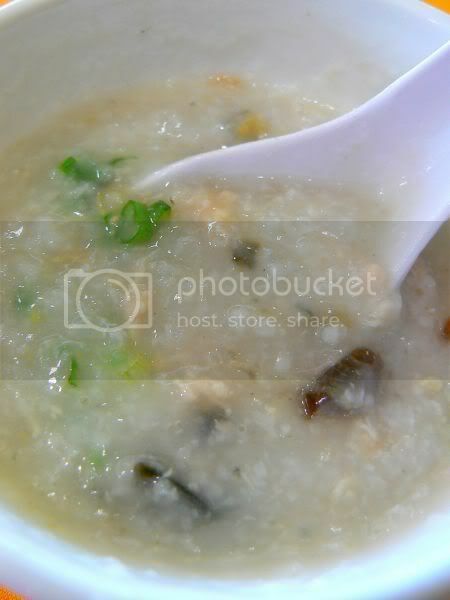 Really lovely porridge with the bits of pork and century egg. My friend and I have a penchant for Xiu Long Baos. We once sat at Shanghai 10 just eating baskets of it one time. Their Steamed Shanghai Bun with Wolfberry or Kei Chi (RM6) was not bad but I felt the skin was slightly too thick. I had trouble nibbling a small hole to taste the soup which was quite nice. Their Har Kau was also something we had trouble searching for as it's known as Jade Prawn Dumpling (RM6.50) with tiny bits of green chives in the skin. Although the prawns were nice and fresh, I felt the skin was also too thick. 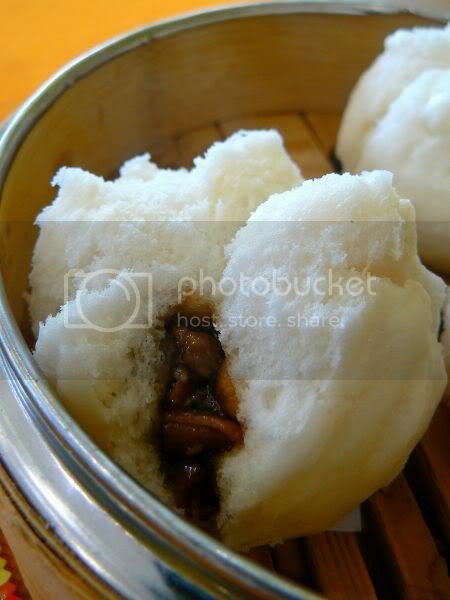 Everyone's must have for dim sum - Char Siu Bao or Steamed BBQ Pork Buns (RM5.50). These were nice and fluffy with a delicious stuffing of chopped meat. 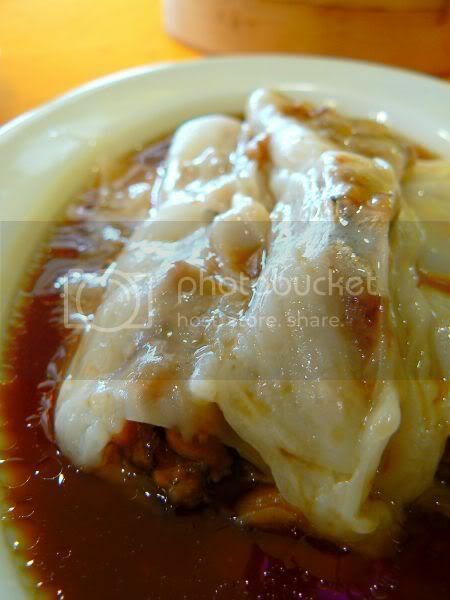 We also ordered the Steamed Cheung Fun with BBQ Pork (RM6) instead of the prawns since we had eaten so many prawn dishes. Here the cheong fun came stuffed to the brim with pieces of char siu in it but the rice flour sheet was slightly thicker versus other places. Musn't forget desserts and we tried their Grass Jelly with Lemon Grass (RM5). This is exactly like the one we always order at Chynna. Nice and refreshing which I liked a lot. 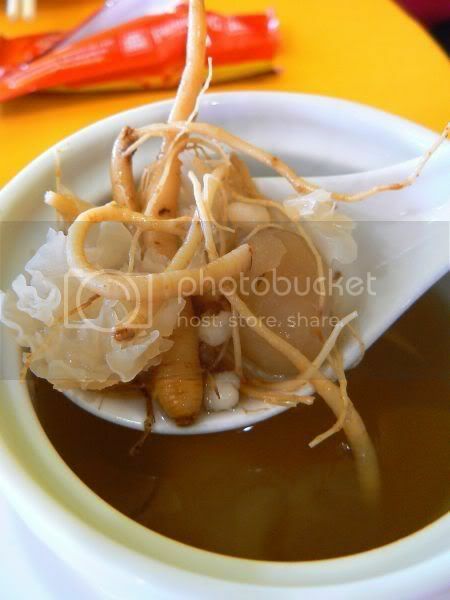 This was also pretty good - Double Boil Barley with Ginseng Root and White Fungus (RM5). It's served cold and the ginseng taste is not very evident hence it's not bitter. Aside from these items, they also have the usual favourites like Fried Radish Cake, Egg Tarts, Loh Mai Fan, Mango Pudding and etc. Prices range from RM4 to RM7 for most of the items. Most expensive item is the Steamed Cheung Fun with Scallop and Pine Nuts at RM12 and the Deep Fried Avocado Puff at RM8. Even though their prices are definitely higher, they make up this with lots of ingredients in their dim sum offerings.